Buchanan On Parade is a 70-minute film from Harold Jeffers Productions, now the property of the Buchanan Masons, which has been made available for unlimited use by the Haralson County Historical Society as a fundraising vehicle. Filmed between 1957 and 1961, this feature portrays everyday life in Haralson County during those years. During the first decade of the 21st century, various attempts were made to caption the film, so as to identify people, places and things within it. The last major effort was undertaken by Ron Feigenblatt, and is the only one which has resulted in any documentation. Three times he hired a member of the local community with potential sentimental motivations to transcribe the handwritten notes produced by the method of testimony described below. Sadly, despite a clear description of the job and wages at hiring time, each time the person hired resigned through protracted inaction before doing any work. Insufficient funds were available to interest the Center for Public History at UWG in this work. Therefore, instead of captioning the film with consistent identifications derived from the testimonial notes, as originally planned, the Society has simply published the scanned handwritten notes online. With the rise of online video and a growing population with the very minimal digital literacy needed to access it, the Society has now elected to publish the film online. It has also created an online discussion forum at which testators can record the types of identifications desired by this project. It is hoped that between the archive of scanned handwritten notes and the new digiral online discussion forum some future party will be able to complete our original plans should the spirit and means one day emerge! This showing was extensively advertised. Media releases to radio and newspapers led to free ads. 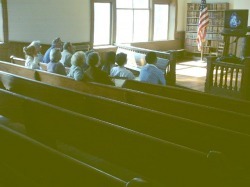 Flyers were posted and distributed at the Historic Courthouse. The library gave out ad bookmarks to each patron borrowing books. 100-200 flyers were distributed at the Senior Valentine Day luncheon in Bremen two days in advance, where a partial sneak preview was shown. The showing took place midday. 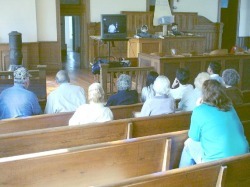 Since there are no blinds in the courtroom, it was not practical to use a borrowed video projector. Instead we used two "direct view" TV sets, one for each half of the wide courtroom. One was 25", the other only 19". Both were fed from the same DVD player and VCR. 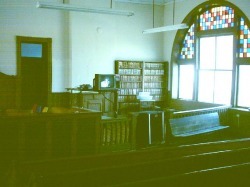 The jury box allows one to run cables without exposing a tripping hazard. But the stage needs a down ramp for people in wheelchairs who come to the room by elevator. At night, even an entry-level projector does a decent job in the courtroom, as tests showed. It would be nice if we might acquire same and start a Friday night film series. A "public performance" license might cost as little as $100 per year, said Roni Tewksbury. Follow-up research by Mary Jarrell puts the annual fee at $190. To maintain order, two volunteer ushers were engaged, Maw and Paw Haralson. Maw had me cut her the new switch you see in her right hand, just in case. 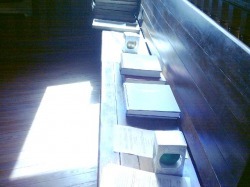 The TV sets were placed on a stack of two tables for enhanced visibility. This works well for most of each half of the courtroom. Perhaps the biggest problem is the glare one can get from the light streaming in from the windows. To seat the audience optimally, one can deploy place-settings at the optimal viewing locations. Not knowing how many people might arrive to view the movie, I deployed 44 note-taking kits in the first three rows and held 6 more in reserve. 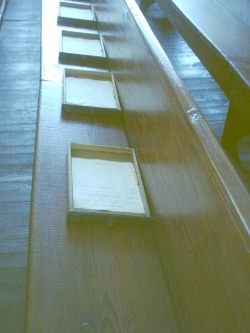 Each note kit consisted of a shallow drawer from the genealogy room cabinet, a sharpened half-length ("golf") pencil, and a ruled film-indexing form, with instructions on top. Few people showed up, so the right-hand gallery with the smaller TV set was not used at all. Eleven people showed up and viewed the first full-speed run. No one stayed for the slow-motion reshowing, even though at least one person complained the movie proceeded too fast to take notes. The majority of the attendees had grey hair. Only one minor attended. 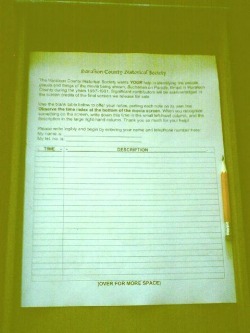 Ten non-blank survey forms were collected. Six had notes, all but one with time indices. This is what the showing looked like to the attendees. That's library manager Jana Gentry in the seat nearest to us. Attendees were given membership applications and invited to tour the building. I offered our books for sale, too, but there were no takers. Two attendees, Wayland Lee and Donald Hamil, brought my attention to the fact that another film had been made just in advance of the opening of the Arrow Shirt plant in Buchanan. They say the late Evelyn Wade's estate might have a copy. Perhaps a Mr. Pope or Raymond Eaves might have other leads. I gave each gentleman a printed copy of Peggy Kimball's recent article on the history of Buchanan, online here, which features the story of the Arrow plant.